Soft rubber head for gentle cleaning of suede and nubuck. Special Shoe Care Brush. Garden Fencing & Borders. Suede Cleaning. Nylon bristles for cleaning shoe wlets and stitching. Tile Tools. Breakdown & Jump Leads. 1 x Electric Shoe Polisher Set. 4 INTERCHANGEABLE HEADS -- 4 brush heads for different use (dust brush polishing brush oil brush brighten brush). NEW DESIGN SHOE BRUSH -- Two level speeds available. Dr Martens Wonder Balsam. Condition is New. Dispatched with Royal Mail 2nd Class. 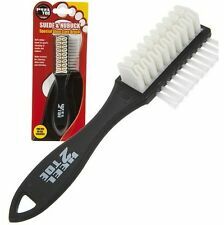 Shine Brush Bristle Pig Hair Shoe Polish Applicator Dauber Boot BuffingWas£3.60 x 2 Price:£2.16 X 2. - Material: Wood and bristle. - Go ash, oiling, polishing ,it is not easy to hurt the leather surface. FIEBINGS SUEDE & NUBUCK/ROUGHOUT DYE. 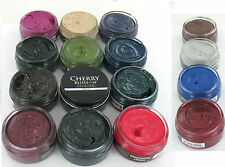 Professional Suede Dye is created specifically for all types of suede. Use for: Suede shoes, boots, handbags, jackets, etc. 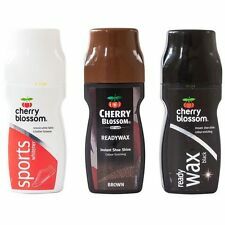 Cherry Blossom Sports Leather Shoe Trainer Whitener 85ml. 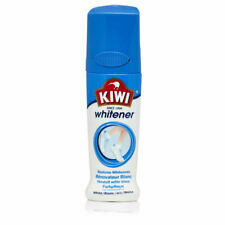 This whitener is suitable for Canvas, Vinyl and leather shoes and covers evenly without streaks. This product Not suitable for suede and nubuck. This all in one shoe cleaning kit features everything you need to shine and maintain the look of your shoes. Shoe Polish Color: Transparent & Black. 2 Jars of Shoe Polish Oil. Features: Portable, Easy to Use, Full Set, Shoes Care. Rockport Premium Shoe Wash Kit. Wash - Organic laundry detergent. Refresh - Deodorant spray. Natural all purpose cleaner and polish. Convenient cleaner that cleans, polishes and protects in one step. Texture: Wax. It can help to reduce dust coverage, slow down aging, odor and prevent mildew. Material: Wood horse hair. Main Color: As the picture shows. Canada Rate (item arrived) 0.0% 47.1% 31.4% 17.6% 3.9%. Rate (item arrived). Kindly Tip Material: Wood Pig Mane. hope you can understanding, will be sincerely appreciated. Rate (item arrived). Canada Rate (item arrived) 0.0% 47.1% 31.4% 17.6% 3.9%. Material: Wood horse hair. Rate (item arrived). Canada Rate (item arrived) 0.0% 47.1% 31.4% 17.6% 3.9%. 100% Buyer Satisfaction! Free and Fast Dispatch! Crosby Sports Instant Whitener. Durable 75ml bottle with built in applicator. High quality shine and finish. Curtain Wire. Fire Supplies. Back to School. General Fancy Dress. Fancy Dress. Crosby Shoe Shine Sponge. High quality shine and finish. Not suitable for Suede or Nubuck. Curtain Wire. Tile Tools. Baby & Toddler. Breakdown & Jump Leads. Fixing & Fastenings. This is a Shoe Polish cleaning kit which includes Neutral & Black shoe polish, shoe brushes, cleaning cloth, and a leather look travel case. The shoe polish has a gloss finish which is waterproof and nourishes the shoe. Trg der eine. Glänzendes Silber 403. Perfectly shaped to fit in your hand, yet compact enough to carry in your handbag, briefcase, or pocket, HandyShine is as easy to use as it is effective. Available in black, brown, and neutral colours, Handyshine is perfect for giving your shoes a quick - but lasting - makeover! This is a Shoe Polish cleaning kit which includes Black shoe polish, shoe brush, cleaning cloth, shoe horn and a leather look travel case. The shoe polish has a gloss finish which is waterproof and nourishes the shoe. Pflegender 1 Glas und Farbe belebender Schuh Politur 50 ml. Suede & Nubuck Special Shoe Care Brush. Soft rubber head for gentle cleaning of suede and nubuck. Nylon bristles for cleaning shoe welts and stitching. Kindly Tip hope you can understanding, will be sincerely appreciated. Material: Wood Pig Mane. Canada Rate (item arrived) 0.0% 47.1% 31.4% 17.6% 3.9%. Rate (item arrived). Trg THE ONE. Nourishing 1 glass and color reviving shoe Polish 50 ml. 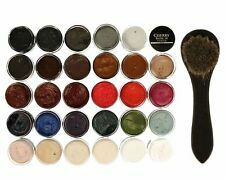 To brush up on color apply evenly and thin the shoe Polish with a cloth on the cleaned, dry shoes. Leave the cream to work for a few hours and then polishing the shoes. 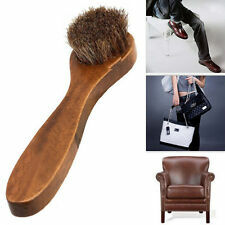 |You will get 1 Brush, 1 Shoeshine, 1 Cloth, 1 Shoe horn, 1 Case. Used for cleaning and polishing your leather shoes. Item: Shoes Care Kit. Quality Nubuck And Suede Multifunctional Heel to Toe Cleaning Shoe Brush - UK This special shoe brush is for suede and nubuck shoes. It will keep shoes looking newer and cleaner for longer. Qty: 1 brush Features: ---Special shoe brush for suede shoes ---Keep shoes looking newer and cleaner for longer ---Soft rubber head and nylon bristles PREMIUM UK SELLER - Royal Mail 2-3 DAYS. (Suitable for: Suede shoes, Nubuck leather shoes. 1 x Rubber eraser. 2) Effortlessly removes spots on suede & nubuck. 6) Ideal for suede, nubuck leather shoes and bags. 1) S shape 3 side shoe cleaning brush, multi-function. This is a Shoe Polish cleaning kit which includes Neutral & Black shoe polish, shoe brushes, cleaning cloth, shoe horn and a leather look travel case. The shoe polish has a gloss finish which is waterproof and nourishes the shoe. TIMBERLAND CLEANING KIT (3) FOR LEATHER OR SUEDE - FREE UK P&P!